We all know that success in the kitchen comes from a bit of experimentation and a flair for all things culinary. 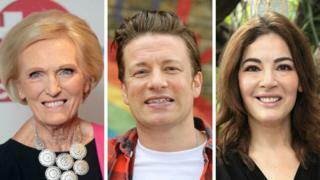 The British public loves nothing more than a good cookery show, but there have been some occasions where TV chefs seem to have got it wrong. Zaleha Kadir Olpin was eliminated from the cooking competition on Monday after judges John Torode and Gregg Wallace complained that her chicken rendang dish didn't have "crispy skin". Viewers were quick to point out that the traditional Malaysian dish was served in the correct way and took to social media to express their outrage that the celebrity chefs did not understand food from different cultures. Malaysian journalist and food writer Jahabar Sadiq agreed, telling the BBC that calling for the dish to be "crispy" rather than "soft and tender" was ignorant. "The meat has to be soft and that's a result of hours of cooking... Many people associate chicken with being fried but there is no craft, no skill." Judge John Torode seemed to welcome the debate, tweeting: "Brilliant how excited you're all getting." Image caption Who knew such an innocent face could cause so much heartbreak? You would have thought that former Bake Off judge and national treasure Mary Berry could do no wrong in the eyes of the British public. But last year, the 83-year-old revealed during her BBC Two show Mary Berry Everyday, that she puts white wine AND double cream in her bolognese sauce. One Twitter user wrote, "I saw Mary Berry adding double cream to a Bolognese sauce... clearly a long career in baking has taken its toll." Another added, "My Italian heritage flared up after hearing about Mary Berry butchering a poor bolognese recipe". She then dug the knife in a little deeper as she chose to serve her sauce with pappardelle, not spaghetti, which many see as the more traditional option. Back in 2016, Essex's most famous chef upset the whole of Spain by putting chorizo in his paella. The dish originates in Valencia and the inclusion of chorizo does not fit with the original recipe for the dish. The good people of Twitter did what they do best and bombarded Jamie with a lot of angry tweets. 4. Nigella Lawson's carbonara "crime"
Image caption Is this is the face of a woman who can't be trusted with a carbonara? Clearly having not learnt from Mary Berry's recipe revamp in March 2017, in July last year, Nigella also took on an Italian dish and changed it. Posting spaghetti alla carbonara on Facebook as her recipe of the day, she included cream in the dish, when the traditional recipe is only supposed to include eggs. Giulia Diane replied to the post, "Nigella, you are a wonderful woman but your recipes are the death of Italian recipes, literally no cream in Carbonara, only eggs!" Silvia D'Ale wrote, "If you tell you're doing a carbonara... do a carbonara then. What's that? Tomorrow I'll make fish and chips with beef and carrots... is that ok?" One Facebook user, Jonathan Longo, even told her to "apologise to the Italian people" and stick to cooking "hamburgers and hotdogs". Image caption Jose Pizarro and Michel Roux Jr cooking on Saturday Kitchen Live got viewers in a panic. Just when you thought Saturday Kitchen, the hallmark of all live-action cooking shows, was safe, they too have been involved in their very own kitchen nightmare. In February last year, chefs Michel Roux Jr and Jose Pizarro made some ham and pork escalopes with a side of homemade crisps. But rather than salivating at the thought of some tasty Spanish fare, some viewers were horrified to see that the pork had been served looking a bit too pink. "What is the current trend for raw meat all about?" wrote one confused fan on Twitter. Another viewer added, "We've had raw beef and raw pork... coming up soon, an omelette with salmonella."